The use of cover crops and poultry manure (PM) is an alternative to reduce the use of synthetic inputs and can contribute to the nutrient cycling in onions ( Allium cepa L.) grown under a no-tillage system. However, this management practice may contribute to an increase in N2O emissions to the atmosphere. The aims of this study were to evaluate the immediate effect on N2O emissions of adding PM onto cover crop residues and to verify the effect of different no-tillage systems on N2O emissions. Two studies (laboratory and field) were conducted with the addition of oilseed radish (OR), black oat (BO), and weed (WD) residues with and without PM under a no-tillage (NT) system. Emission of N2O (kg ha-1) was influenced by the different residue-management systems and was higher in treatments with OR residues (2.96 ± 0.67 kg ha-1 for OR and 5.28 ± 1.04 kg ha-1 for OR + PM). The other treatments behaved similarly with emissions of approximately 1.91 ± 0.17 kg ha-1 of N-N2O. The highest N2O emissions in the field study were found within the first 15 days and represented 50.3 % of the average emissions. Poultry manure showed high emissions when the cover crop was OR, but not when it was BO and WD. 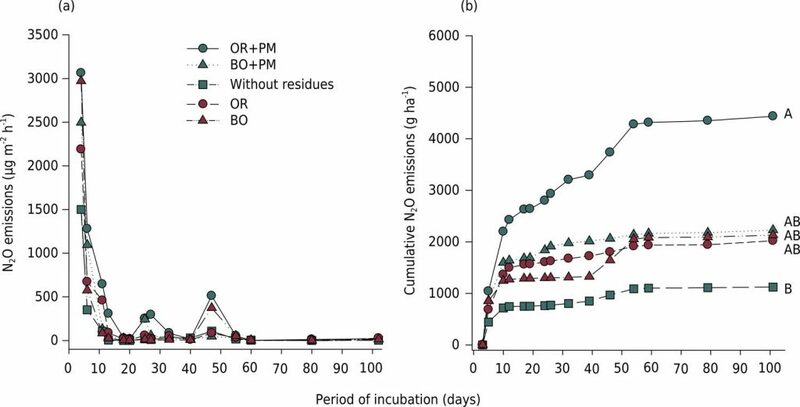 Fluxes (a) and cumulative emission (b) of N2O-N in soil with the addition of residues of oilseed radishes + poultry manure (OR+PM), black oats + poultry manure (BO+PM), oilseed radishes (OR), black oats (BO), and without residues. Means followed by the same letter are not statistically different from each other by the Tukey test at 5 % (n = 4).